This is something that will be of interest for Nvidia GPU miners that use GeForce GTX 750/750 Ti or the newer GTX 970/980 GPUs – a new ccMiner fork with optimized kernels for the Maxwell architecture (Compute 5.0 or 5.2) by SP. 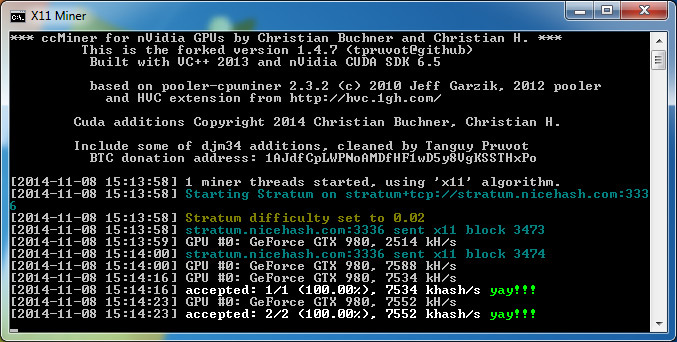 The ccMiner release 1.4.6.sp.Beta6 (source) is forked from tpruvot’s release supporting most of the available algorithms, but the focus here is to get the maximum performance out of the Maxwell GPUs. We have compiled a windows binary of the miner that you can download from the below, it is a 32-bit version compiled with VS2013 and with the latest CUDA 6.5 that has official support for GTX 970 and GTX 980 GPUs. Do note that archive includes a compiled binary for Compute 5.0, so it will not work on older video cards that are not based on the Maxwell architecture. Our tests have show that on a stock GeForce GTX 980 video card with no overclock we are getting about 7550 KHS for X11 up from about 6500 with the ccMiner 1.4.5-tpruvot under the same conditions and on the same hardware, X13 is up to about 6000 KHS with the SP optimized miner versus about 5300 KHS with the version from tpruvot. So definitely worth trying if you have some Maxwell hardware and you are mining with it to get the best possible performance, overclocking of course also brings the hashrate higher.